Leaf: few to many in rosette; cauline few, 5--30 cm, narrowly oblanceolate to obovate, entire, tapered to long, slender petiole, tip acute or obtuse. Inflorescence: stems 1--7, 2--6 dm, each with open, 20--100-flowered, panicle-like cyme; flowers well-exserted from leaves; bracts among flowers and below, awl-like, gland-toothed; pedicel 5--10 mm. Flower: sepals 2, 1/4--1/3 × corolla, +- round, margin gland-toothed; petals 6--7, +- 8 mm, lanceolate, pale pink, base yellow-green, veins magenta, tip jagged; stamens 4--5; stigmas 3. Fruit: 3--4 mm. Seed: 1--few, 2 mm. Chromosomes: n=+-12. Synonyms: Lewisia columbiana (Howell ex A. Gray) B.L. Rob. subsp. congdonii (Rydb.) Ferris; Oreobroma congdonii Rydb. 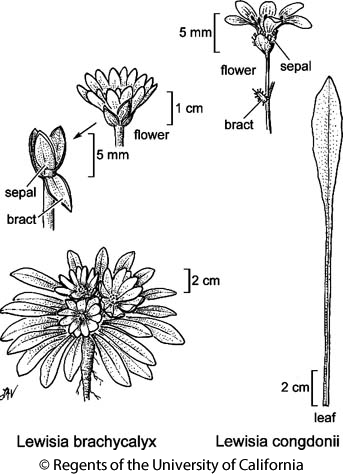 Citation for this treatment: John M. Miller & Lauramay T. Dempster 2012, Lewisia congdonii, in Jepson Flora Project (eds.) Jepson eFlora, http://ucjeps.berkeley.edu/eflora/eflora_display.php?tid=30828, accessed on April 20, 2019.
c SN. Markers link to CCH specimen records. Yellow markers indicate records that may provide evidence for eFlora range revision or may have georeferencing or identification issues. Purple markers indicate specimens collected from a garden, greenhouse, or other non-wild location.